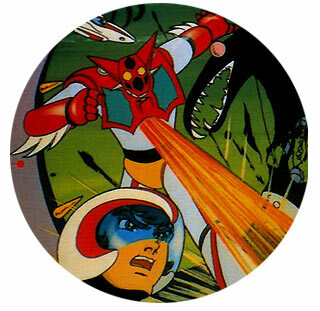 Getter Robo was the original Transformer, airing in Japan in 1974. It was three different robots that could combine in various combinations to make one of several larger robots. The original series came to the US as Starvengers in 1980 (part of Force Five). A number of sequels were produced over the years, including the 1998 Change Getter Robo, which A.D. Vision is releasing as Getter Robo Armageddon. If you're into retro-robots featuring stunningly slick animation (Big O and Giant Robo come to mind), then add this to your collection. Be warned there is considerable violence, although of the monster/fantasy variety, lots of chopping up of beasties, exploding heads and so forth.... It's great fun with tons of heavy-metal action! 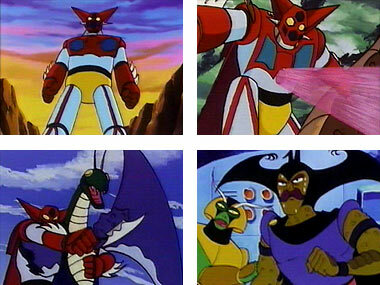 Below: Scenes from the original 1974Go Nagai classic anime robot series Getter Robo. For more info check out this Getter Robo fan website. 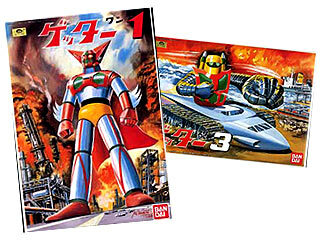 Below: Packaging from vintage Getter Robo toy model kits.